The outlook for heavy-duty truck makers continued to improve as they logged April increases over the prior month and the same period a year earlier, trucking industry consulting firms FTR Intelligence and ACT Research said Wednesday. Orders for Class 8 trucks rose 4 percent from March and climbed 77 percent from April 2016 to 23,600 vehicles, according to FTR Intelligence. “Since order season for 2017 trucks began in earnest in October, the industry has booked net orders of 147,281 units, up 7 percent year-over-year and far better than expectations at the start of order season,” said Michael Baudendistel, a Stifel Financial Corp. analyst. 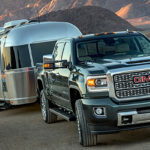 “We continue to view recent trends in the North American truck market favorably, and believe conditions are setting up well for a strong 2019-2020,” he said. Still, the jump in orders isn’t likely to increase heavy-duty truck production this year, said Ann Duignan, an analyst at Morgan Stanley Research. Although the latest order numbers represent the strongest volume in 22 months, Duignan forecasts an 8 percent drop in Class 8 production to 210,000 trucks this year. “The Class 8 market continues to show some solid momentum as orders remain at good levels and production is starting to rise,” he said. After hitting a nine-plus year high in March, orders for trucks in the Class 5 through 7 weight market dropped 25 percent from March to 18,200 vehicles in April, falling 10 percent compared with the same period a year earlier, ACT Research said. 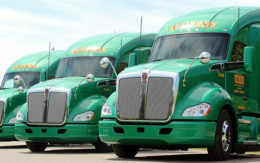 Duignan forecasts Class 5-7 truck production will increase 3 percent this year to 240,000 units.